Ellen and I took a trip to Austria and Slovakia for a week. Here's the third day's activities. For previous days: Day 1, Day 2. We got back to Vienna around noon, just in time for lunch at a quaint little Turkish restaurant. Though they unfortunately did not have any Turkish Delight, they did have Turka Cola, which tasted remarkably like RC Cola, Shasta Cola, and every cola knock-off I’ve ever tried. Coming out of the subway station was like entering a whole new world, and not metaphorically like the theme from "Aladdin" . Everywhere we looked we were surrounded by majestic architecture, intricate and grandiose palaces and gardens, and the hustle and bustle of trade and exchange. At least eight different museums dotted the map within 15 minutes of walking from St. Stephen’s Cathedral at the center of the city, and we managed to see the outsides of all eight, but only the inside of three. The first was the Kunsthalle, the Conemporary Art Museum, which had an exhibit on Edward Hopper. It wasn’t really my cup of tea, but I did find some works by German named Thomas Demand that I found quite interesting. The best part of the Kunsthalle would have to be the gift shop, where they had all of the Coolest T-shirt Contest winners. The funniest thing about them was the price: a whopping 35 euros apiece. The last time I paid 35 euros for a T-shirt it was edible. Before the next museum, we took a little tram ride. Our tourist map from the hostel said there were two trams that went in clockwise and counter-clockwise circles around downtown. So we hopped on one, and before we knew it we were miles outside of the city, studying the sign that said “As of October 26, the tram no longer goes in a circle, you idiot tourists,” or something to that effect. We rode back to town, defeated, but when we got back to Stephansplatz and saw a parade of shirtless Turkish men, we knew we’d hit on yet another jackpot. The rainbow colored “PEACE” flag, typically used for gay pride, kind of gave us the wrong first impression of what was happening. 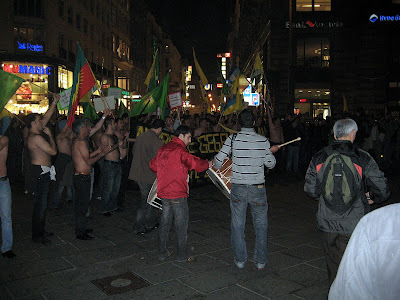 From the German that Ellen understood, it seemed there was some sort of Turkish political figure that was wrongly imprisoned, so there was a march that for some reason demanded the men be shirtless in the cold of October. Whether it was as cool as the random donkey art in Bratislava is something that is sure to be debated for years to come. Next, we ambled down to the Haus der Musik, a museum that is like a wonderland for small children. Basically every display and exhibit is interactive, you can play wacky instruments, and it even has a place to create your own CD recording using a wide variety of sounds and effects. Some available sounds: wind over the Sahara desert, a man farting, the Apollo 11 launch, feedback, and oh so many more. I found a great remixed Beethoven by a guy named Stefan Obermaier, but the CD was about 20 euros at the gift shop, so I passed. The last time I spent 20 euros on a CD it was edible. I mean audible. Actually, no I don’t. After the subway ride back to the hostel and relaxing to the soothing sounds of Arnold Schwarzenegger, the recorded subway announcer, we grabbed a light dinner, a few drinks, and turned in early. Tomorrow we’d be hitting the Albertina, the most impressive museum that I’ve been to yet.